General Breckner was born in Alliance. He is the son of William J. Breckner, Sr. and the late Pauline Bertschy Breckner. After graduation from high school he attended Ohio State University, Troy State University, and graduated from State University of New York. He is a graduate of Squadron Officer School, the Air Command and Staff College, the National War College and the program for senior government managers at Harvard University. General Breckner received his commission and wings through the aviation cadet program in 1955 and attended Day Fighter School at Nellis Air Force Base in Nevada. He is now Commander of the 17th Air Force, the Sembach Tactical Operations Center and the NATO Sector Operations Center Three in Germany. He commands all United States Air Force wings throughout Germany, the Netherlands, and Belgium. He was formerly Chief of Staff, headquarters United States Air Forces in Europe. While stationed at Lockbourne AFB in Columbus, Ohio, General Breckner married the former Cheryl V. Carmell on August 30, 1963. They have a son, Rand and a daughter, Kristen. General Breckner is a Vietnam combat veteran with two tours in Vietnam. During his first tour in 1966, as an exchange pilot with the U.S. Navy for 38 months, he flew 100 fighter-bomber missions in A-4’s from the aircraft carrier USS Intrepid. He has a total of 219 carrier landings. He returned to Vietnam in 1972 serving as operations officer for the 435th Tactical Fighter Squadron, 8th Tactical Air Wing, flying F-4 Phantoms. On July 30, 1972 he was shot down over Hanoi by a surface to air missile and was a prisoner of war until March 1973. General Breckner is a command pilot with 5,100 hours in fighter aircraft. His military decorations include the Silver Star, Legion of Merit with an oak leaf cluster, the Bronze Star with oak leaf cluster, Air Force Commendation Medal with two oak leaf clusters, Navy Commendation Medal with “V” device, Purple Heart with one oak leaf cluster, and Republic of Vietnam Gallantry Cross with Palm. 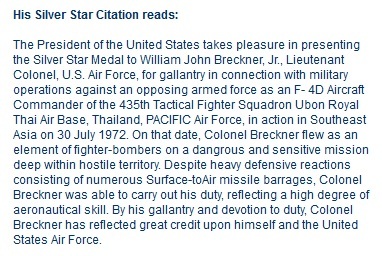 Biographical update: In August of 1994, General Breckner became commander of 17th Air Force and he retired from the Air Force in this position on November 1, 1986. In retirement, he was very active in the Colorado Springs community serving on the Airport Advisory Committee, the Airport Business Park Board and volunteering with numerous other organizations. On February 16, 2008, General Breckner was killed when his car slid off the road on a curve. He was 74 years old. Active to the end of his life, he was planning to go skiing at Breckenridge the next weekend. He is survived by his son, Rand (Toni) Breckner; daughter, Kristen Breckner and a granddaughter, Holli. He was preceded in death by his spouse, Cheryl who passed away on August 11, 2007. They are buried together in the U.S. Air Force Academy Cemetery in Colorado Springs.